Where can I find out more about careers at Abbott Diabetes Care? What's the difference between HbA1c tests and the blood glucose tests I do at home? The HbA1c test indicates your average blood glucose level for the previous two to three months and is taken by a Healthcare Professional and calculated in a laboratory. The blood glucose test you can perform at home on your FreeStyle Meter is your blood glucose level at that moment in time. Your home FreeStyle blood glucose monitoring system reading is given in mmol/l i.e. 6.3mmol/l and the HbA1c is given in mmol/mol ie. 58mmol/mol. How often should I test my blood glucose? Your Healthcare Professional will advise you on how often you should check your blood glucose level. The frequency of testing will depend on the type of diabetes you have and your treatment plan agreed with your Healthcare Professional. What are ketones and why should I test for them? High levels of ketones are toxic to the body leading to ketoacidosis which can be life threatening. Learn more here on ketoacidosis. What should a normal blood glucose level be? You and your healthcare professional will decide what your target blood glucose levels should be as this will vary with individual needs. Click here for more information. How do I subscribe to your members’ programme? How do I unsubscribe from your members’ programme? What are the benefits of joining the members programme? FreeStyle Progress is designed to help you feel more confident about managing your diabetes. Our online support resource is full of useful information, valuable clinical insights and practical tips to help you improve your control and get the most out of life. What is the Triangle of Diabetes Care Programme? The Triangle of Diabetes Care programme is part of our education programme which will take you through a new model on managing diabetes. This model has been developed by a Diabetes Consultant in Leeds with years of managing various states of diabetes. Find out more information once you login to FreeStyle Progress. How do I update my contact details/password? You can submit a product review via your FreeStyle Progress account. Create an account today if you don't already have one. Where can I get replacement control solution? Can I register my warranty online? Yes - if you create a FreeStyle Progress account you can register your FreeStyle meter warranty* once you log in. What Is the FreeStyle Optium Neo meter? The press screen device is user friendly and has some great features to help you manage your diabetes. The FreeStyle Optium Neo meter will log your glucose readings and remember them, and it can be used to log the insulin doses you take. By comparing these two sets of data, the FreeStyle Optium Neo meter can help you spot trends in blood glucose levels and help you to correct them proactively before they occur. Where can I get a FreeStyle Optium Neo meter? Do I need a prescription? Speak to your Healthcare Professional. You will need a prescription from your Healthcare Professional to get the FreeStyle Optium Blood Glucose strips compatible with the meter. Download the prescription information. What test strip does the FreeStyle Optium Neo Meter use? The FreeStyle Optium Neo uses FreeStyle Optium Blood Glucose Test Strips to test blood glucose and FreeStyle Optium Blood β-Ketone Test Strips to test blood ketone levels. How much blood do I need for the FreeStyle Optium Test Strip? The FreeStyle Optium Blood Glucose Test Strips require 0.6 μl of blood to obtain a result. When you have applied enough blood to the test strip, you will see 3 short lines on the meter screen, then you will see a 5 second countdown. When measuring ketones using the FreeStyle Optium β-Ketone Test Strips you will require 1.5 μl of blood and there will be a 10 second countdown measuring blood ketones. How do I turn on the FreeStyle Optium Neo Meter? Insert a FreeStyle Optium test strip to perform either a blood glucose or blood ketone test. Alternatively press and hold the ‘butterfly’ in the middle of the meter until the start-up screen appears. How do I perform a blood glucose test with the FreeStyle Optium Neo meter? Please refer to the Owner's leaflet before testing. Testing blood glucose with the FreeStyle Optium Neo meter is very similar to testing with other FreeStyle meters. You can either use your fingertip or one of the alternative test sites (upper arm; forearm; base of thumb) VIDEO. Wash your hands and the test site with soap and warm water prior to performing the test. Rinse and dry thoroughly, do not use lotion or cream on test site. Remove the FreeStyle Optium Blood Glucose test strip from its foil wrapper. Insert the FreeStyle Optium Blood Glucose test strip into the meter. Use the lancing device to obtain a blood drop. Apply blood to the test strip - bring the blood drop to the white area at the end of the strip. The blood is drawn into the test strip. The meter will beep once to let you know that enough blood has been applied and 3 short lines will appear on the meter screen. After doing a glucose test, 'KET' appeared on the screen then vanished? If a blood glucose result is 13.3 mmol/L or higher, KET will blink 3 times on the screen. If you have been advised by your healthcare professional to test for ketones, now may be the time to do so. Always follow your healthcare professionals advise on when to test for ketones. What is the FreeStyle Optium Neo meter's result range? 1.1 mmol/L - 27.8 mmol/L. How many readings can be saved? Up to 1000 events, including blood glucose, ketone and control solution results, insulin doses and other meter information can be saved in the meter's memory. In my FreeStyle Optium Neo meters memory, a reading is shown then blinks "Ctl", what does this mean? A reading in the FreeStyle Optium Neo meter memory that flashes between a result and "Ctl" means this reading was recorded as a Control Solution Result. With my result I see a red arrow blinking. What does this mean? If you have had 2 low results occurring in a 5 day period and both are within the same 3-hour time period. The meter will display a blinking red arrow to show a Low Trend. When the clocks go forward/back, how do I update the time in my meter? You can find the instructions you need in our pdf guide. Which control solution should be used with the FreeStyle Optium Neo meter? When should I use Control Solution? How long does the control solution last? When you open a control solution bottle for the first time, count forward 90 days and write this date on the control solution bottle. Throw away any remaining solution after this date. Does the FreeStyle Optium Neo meter link to an insulin pump? No, the FreeStyle Optium Neo meter does not link to an insulin pump. Can I erase test results from the memory of the FreeStyle Optium Neo meter? Test results cannot be erased from the memory of the FreeStyle Optium Neo meter. Once the memory of the device is full, however the oldest test result will be automatically deleted by the system. Does FreeStyle Optium Neo meter have blood ketone testing capabilities? The FreeStyle Optium Neo meter not only has blood glucose testing capabilities but also has blood ketone testing capabilities; you will need FreeStyle Optium blood beta-Ketone test strips to test your ketone levels. Can I upload results from the FreeStyle Optium Neo meter into a data management system? Yes, results can be uploaded to the FreeStyle Auto-Assist Neo software. How long do the batteries last on the FreeStyle Optium Neo meter? The batteries will last for up to 3000 tests. At 6 tests a day, this equates to approx. 500 days of use before the batteries need replacing. What batteries does the FreeStyle Optium Neo use and where can I get replacements? What if I have purchased new batteries but they don't work? What does error message - E-1 mean? 2. Wait for the meter and test strips to adjust to the new temperature. 3. Repeat the test using a new test strip. What does error message - E-2 mean? 1. Turn off the meter. 2. Repeat the test using a new test strip. What does error message - E-3 mean? 1. Review the testing instructions. What does error message - E-4 mean? The blood glucose level may be too high to be read by the system or There may be a problem with the test strip. 1. Repeat the test using a new test strip. What does error message - E-5 mean? What does error message - E-6 mean? 2. Repeat the test using a test strip for use with your meter. What does error message - E-7 mean? What does error message - E-9 mean? What is the FreeStyle Auto-Assist Neo Software and how can I download it? FreeStyle Auto-Assist Neo Software is PC compatible software that permits patients, healthcare teams and caregivers to manage diabetes with reports, reminders and messages. It allows you and healthcare professionals to view reports, configure the FreeStyle Optium Neo meter and get updates to the software. Abbott Diabetes Care recommends you work with your healthcare professional to understand the report data. Software can be downloaded from our website. What is the current version of the FreeStyle Auto-Assist Neo Software? The current version of the FreeStyle Auto-Assist Neo Software is version 1.22. What is the price for the FreeStyle Auto-Assist Neo Software? There is no cost for the FreeStyle Auto-Assist Neo Software and it can be downloaded from our website. Is my data secure using the FreeStyle Auto-Assist Neo Software? Yes, FreeStyle Auto-Assist Neo Software does not save any data on your computer. The data is only available through interactions with the meter; no data is available without direct access to your meter unless you have saved pdfs of the data on your computer. How can I receive help to use the FreeStyle Auto-Assist Neo Software? You can contact customer service for support on 0800 170 1177 (UK) or 1800 77 66 33 (ROI). Abbott Diabetes Care recommends you work with your healthcare professional to understand the report data. What are the system requirements for the FreeStyle Auto-Assist Neo Software? What are the internet connection speed requirements for uploading data to the FreeStyle Auto-Assist Neo Software? Best performance of the FreeStyle Auto-Assist Neo Software will be achieved with an internet connection speed of 56KB/sec or above. Are there any accessories I need to have for uploading data to the FreeStyle Auto-Assist Neo Software? You need a standard USB to micro-USB cable to upload data to a computer. The USB cable is provided with the FreeStyle Optium Neo meter. Can I share the FreeStyle Auto-Assist Neo Software on a network? No, FreeStyle Auto-Assist Neo Software must be installed locally on the computer where it will be used. If you download pdfs of your reports you can share these. Can I enter data into FreeStyle Auto-Assist Neo Software? Data can be entered for the configuration of the FreeStyle Optium Neo meter. However, insulin and blood glucose information cannot be added or modified via FreeStyle Auto-Assist Neo Software. Can I delete data from FreeStyle Auto-Assist Neo software? Your configuration data for the FreeStyle Optium Neo meter can be deleted. However, insulin and blood glucose information cannot be modified or deleted via the FreeStyle Auto-Assist Neo system. How am I able to view the data when using FreeStyle Auto-Assist Neo Software? Statistical and other calculations are automatically performed using the data contained in the meter, and results are put into tables and graphs. A report contains one or more tables and graphs presented in a way that is designed to be helpful for diabetes management. Can I merge or import data from my current data management program into FreeStyle Auto-Assist Neo Software? No, you can only interact with data currently on the FreeStyle Optium Neo meter. Can I use FreeStyle Auto-Assist Neo Software to do a quick upload and then print the results? Yes, FreeStyle Auto-Assist Neo Software does allow the option to print selected favourite reports immediately after connecting the FreeStyle Optium Neo meter to any compatible PC. Can I share my data from FreeStyle Auto-Assist Neo Software? Yes, FreeStyle Auto-Assist Neo Software allows you to share data by saving or printing reports. Once the data is saved and downloaded to the computer, it can be emailed to your Healthcare Professional. Is my data automatically stored on the computer? No, your data is stored on the meter; you can save a PDF report of the data on the computer. Additionally, you can save settings on your computer in a backup file so if you lose your meter you can reload the old settings. Can I export data from FreeStyle Auto-Assist Neo Software to use in another format? Yes, data from FreeStyle Auto-Assist Neo Software can be exported to a Tab delimited file ('.tab) or an XML file ('.xml), then imported into another program or format if desired. What Is the FreeStyle InsuLinx? The FreeStyle InsuLinx offers features including a meal-time insulin calculator, touch screen designed for ease of use, automated logbook, personalisation, weekly messages, before and after meal-tagging, and FreeStyle Auto-Assist software in addition to all of the benefits of FreeStyle technology. What test strips do I use with the FreeStyle InsuLinx meter? How do I perform a blood glucose test with the FreeStyle InsuLinx? Please refer to the Owner's Booklet before testing. Testing blood glucose with the FreeStyle InsuLinx meter is very similar to testing with other FreeStyle meters. You can either use your fingertip or one of the alternative test sites (upper arm; forearm; base of thumb). Wash the hands and the test site with soap and warm water prior to performing the test. Rinse and dry thoroughly. Do not use lotion or cream on the test site. Insert a FreeStyle Lite test strip and close the test strip vial. Apply blood to the test strip as shown in the owner's booklet. The meter will beep once to let you know that enough blood has been applied. Once you start applying blood, you have 60 seconds to fill the test strip on the same side of the test strip only. The time left is shown as a countdown on the screen. The time the meter takes to display a result depends on your blood glucose level. The higher the blood glucose level, the longer it takes to get a result. The meter turns off automatically after 2 minutes of inactivity. Remove and reinsert the unused test strip to restart the meter. IMPORTANT: After performing a blood glucose test wash your hands and the test site with soap and water. Thoroughly dry your hands and the test site. What's the difference between the Easy and Advanced setup? Easy setup is for users who use a fixed dose of rapid-acting insulin before meals. Advanced setup is for users who count carbohydrates (in grams or servings) and use a correction factor to adjust doses of rapid-acting insulin at meals. The insulin calculator will have to be set up by the Healthcare Professional. All the instructions you need are available in our guide. What is the code for the Rapid-acting Insulin Calculator? The code is only provided to healthcare professionals. This is a safety feature to ensure only accurate information is entered and used to provide a Suggested Insulin Dose. Work with your Healthcare Professional to set up or change your settings. What is the maximum suggested dose the meter will offer? The suggested dose will not exceed 50 units, the maximum allowable dose by the meter. 4°C to 40°C (40°F to 104°F). How many batteries does this meter use? The FreeStyle InsuLinx require 2 x CR2032 v3 Lithium batteries. Does the FreeStyle InsuLinx link to an insulin pump? No, the FreeStyle InsuLinx does not link to an insulin pump. Where can I get the FreeStyle InsuLinx meal-time insulin calculator setup? The insulin calculator will have to be set up by the healthcare professional. Can I erase test results from the memory of the FreeStyle InsuLinx? Test results cannot be erased from the memory of the FreeStyle InsuLinx. Once the memory of the device is full, however the oldest test result will be automatically deleted by the system. Where can I get a FreeStyle InsuLinx? Do I need a prescription? The FreeStyle InsuLinx is available through healthcare professionals in diabetes clinics. You will need to get a prescription for the FreeStyle Lite Strips which are compatible with the meter. Download the prescription information. Does FreeStyle InsuLinx have blood ketone testing capabilities? The FreeStyle InsuLinx currently does not have the capability to test for ketones. However, within the FreeStyle brand we offer the FreeStyle Optium Neo meter which has both blood glucose and blood ketone testing capabilities. What is the glucose result range for the FreeStyle InsuLinx? 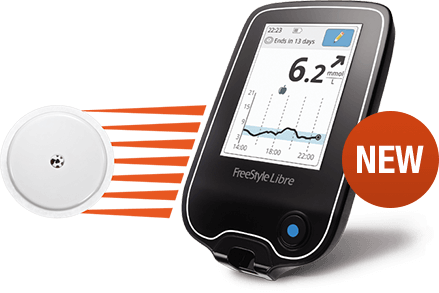 The glucose result range for the FreeStyle InsuLinx blood glucose monitoring system is 1.1 mmol/L to 27.8 mmol/L. Which control solution should be used with the FreeStyle InsuLinx? The FreeStyle InsuLinx uses FreeStyle control solution, the same as the FreeStyle Lite and FreeStyle Freedom Lite systems. Can I upload results from the FreeStyle InsuLinx into a data management system? Yes, results can be uploaded to the FreeStyle Auto-Assist Software. My meter is showing an error message? What is the FreeStyle Auto-Assist software? FreeStyle Auto-Assist is software which is compatible with the FreeStyle InsuLinx, FreeStyle Lite and FreeStyle Freedom Lite. The Software offers a solution that permits patients with diabetes, healthcare teams and caregivers to manage diabetes with reports, reminders and messages. It allows you and your Healthcare Professional to view reports, configure the FreeStyle InsuLinx meter and get updates to the software. Abbott Diabetes Care recommends you work with your health care professional to understand the report data. What is the current version of the FreeStyle Auto-Assist software? Software is built into the FreeStyle InsuLinx meter and accessed by plugging into the USB port of any compatible PC or Mac. If you have the FreeStyle Lite and FreeStyle Freedom Lite meters you will need to download the software from our website. How do I obtain the FreeStyle Auto-Assist software? What is the price for the FreeStyle Auto-Assist software? There is no cost for the FreeStyle Auto-Assist software as it is included and installed through the FreeStyle InsuLinx meter. If you have the FreeStyle Lite and FreeStyle Freedom Lite meters you will need to download the software from our website. Is my data secure using the FreeStyle Auto-Assist software? Yes, FreeStyle Auto-Assist software does not save any data on your computer automatically. The data is only available through interactions with the meter; unless you save the PDF reports on your computer. How can I receive help to use the FreeStyle Auto-Assist progress software? You can contact the Customer Careline on 0800 170 1177 for support on the FreeStyle Auto-Assist software. Abbott Diabetes Care recommends you work with your Healthcare Professional to understand the report data. What are the system requirements for the FreeStyle Auto-Assist progress software? What are the internet connection speed requirements for uploading data to the FreeStyle Auto-Assist software? Best performance of the FreeStyle Auto-Assist software will be achieved with an Internet connection speed of 56KB/sec or above. Are there any accessories I need to have for uploading data to the FreeStyle Auto-Assist software? You need a standard USB-to-micro B USB cable to upload data to a computer. The USB cable is provided with the FreeStyle InsuLinx blood glucose monitoring system and upon request from the Careline 0800 170 1177 for other meters. Can I share the FreeStyle Auto-Assist software on a network? No, FreeStyle Auto-Assist software must be installed locally on the computer where it will be used. You can download reports from the software as a PDF and share these. Can I enter data into FreeStyle Auto-Assist software? Data can be entered for the configuration of the FreeStyle InsuLinx blood glucose monitoring system. However, insulin, blood glucose, carbohydrate intake information cannot added or modified via FreeStyle Auto-Assist software. Can I delete data from FreeStyle Auto-Assist software? Your configuration data for the FreeStyle InsuLinx can be deleted. However, insulin, blood glucose, carbohydrate intake information cannot be modified or deleted via the FreeStyle Auto-Assist system. How am I able to view the data when using FreeStyle Auto-Assist software? Statistical and other calculations are automatically performed using the data contained in the meter, and the results are put into tables and graphs. A report contains one or more tables and graphs presented in a way that is designed to be helpful for diabetes management. Can I merge or Import data from my current data management program Into FreeStyle Auto-Assist software? No, you can only interact with data currently on the FreeStyle InsuLinx. Can I use FreeStyle Auto-Assist software to do a quick upload and then print the results? Yes, FreeStyle Auto-Assist software does allow the option to print selected favourite reports immediately after connecting the FreeStyle InsuLinx to any compatible PC or Mac. Can I share my data from FreeStyle Auto-Assist software? Yes, FreeStyle Auto-Assist software allows you to share data by saving or printing reports. Once the data is saved and downloaded to the computer, it can be emailed your Healthcare Professional. No, your data is stored on the meter. Additionally, you can save settings (saved insulin calculator settings, notes, reminders, etc.) on your computer in a backup file as an .Abbott Diabetes Care file. Can I export data from FreeStyle Auto-Assist software to use in another format? Yes, data from FreeStyle Auto-Assist software can be exported to a Tab delimited file ('.tab) or an XML file ('.xml), then imported into another program or format if desired. PC' is showing on the screen, what does this mean? What is the weight of the meter? Can I get a new FreeStyle Lancing device? Contact our customer services team on 0800 170 1177 (UK) or 1800 77 66 33 (ROI) and we will send a replacement to you free of charge. What are the system requirements for the CoPilot Health Management System? Microsoft® Windows® 7, Vista, XP and 2000 operating systems. What glucose monitoring devices (meters) are supported by the CoPilot system? Are there any accessories that I need to have for uploading data to the CoPilot system? Presently we have four cables to use depending which meter you have. Precision Link Direct Data Cable (9 PIN Serial Cable) for all Precision Xtra meters. Can I upload data from more than one device to my CoPilot system account? Yes. For each CoPilot system account, you are able to upload data from more than one device (e.g. from both a FreeStyle meter and a FreeStyle Optium meter (Precision Xtra) and have the data combined in your account. After the first upload from a device, the system will thereafter automatically identify that device and associate it with the assigned user. Can I merge or import data from my current data management program into the CoPilot system? Can I export data from the CoPilot system to use in another format? Data from the CoPilot system can be exported to a Tab delimited file (*.tab) then imported into another program or format if desired. For instructions on how to export data, please refer to the CoPilot system user's guide. How is data handled by the CoPilot system if more than one reading for a particular event is logged in one time period, (e.g. 2 blood glucose readings Before Breakfast)? Will it be displayed as multiple tests for a specific time and will all entries be calculated into report graphs and statistics? In the CoPilot system, all readings in a Time Period will be displayed and included in graphs and statistics, either with data points or averages. What is the CoPilot system? The CoPilot system is a personal computer (PC)-based software application that permits people with diabetes, their healthcare team, and caregivers to upload data from FreeStyle meters and the FreeStyle Optium meters into the CoPilot system. The CoPilot system provides graphs and other software tools for people with diabetes and their healthcare professionals (HCPs) to help evaluate and analyze glucose readings, carbohydrate intake, insulin dosage, and other diabetes-related factors uploaded from devices or manually entered into the CoPilot system. The CoPilot system can help identify trends that can be used to educate persons with diabetes to improve their glucose control. How do I obtain the CoPilot system? The CoPilot system is currently not available for download. Please call Customer Service on 0800 170 1177 for further information. How can data be entered into CoPilot system? All data can be entered manually or by uploading from one of the devices listed. How am I able to view the data once it is stored in the CoPilot system? Statistical and other calculations are automatically performed on the data, and the results are put into tables and graphs. A report is one or a set of these tables and graphs designed to present information helpful for health management. Am I able to share my data from the CoPilot system? Yes. The CoPilot system allows you to share your data in a variety of different ways. These include printing, faxing, and emailing. Is my data secure using the CoPilot system? Yes. The CoPilot system has security features to ensure that your data cannot be read or changed by others without your approval. The CoPilot system uses passwords to prevent unauthorized use of the CoPilot system. Each CoPilot system user establishes a User ID and Password the first time they use the CoPilot system. Can I use the CoPilot system on a network? Yes. By installing a separate server setup program this will allow you to set up a CoPilot system database on a central computer (server) that will provide data access for one or more CoPilot system installations (clients) residing on other machines in a common network. Can I delete data from the CoPilot system? No. Data cannot be deleted in the CoPilot system but it can be hidden so the data will not be included in all the reports except the Diary List report. Can I use the CoPilot system to do a quick upload and then print the results? Yes. The CoPilot system does allow as an option to print your favourite reports immediately after you upload your device. Since it is a true heath management system database, you will first need to setup a user. Will I need to select a user each time I perform an upload to the CoPilot system? No. Once a device is uploaded it will associate the serial number of that device with that particular user unless you choose otherwise. How far can the Receiver and Transmitter be apart? A 30 metre (100 feed) range is available between the Receiver and Transmitter. What times are the blood glucose calibrations due? Calibration is require - at approximately 1,2,10,24 and 72 hours after a Sensor Insertion. My TRU directional arrow is laying flat, what does this mean? Do I need to replace the batteries? Both the Receiver and Transmitter have sealed batteries which cannot be replaced. The Receiver can be recharged with the USB Cable provided. The Transmitter battery will last around 365 days of continual use. Once empty, a replacement Transmitter is required. How far under the skin is the Sensor Inserted? Each new Sensor is inserted 5mm under the skin. What software is used to download readings from the FreeStyle Navigator? The FreeStyle CoPilot Software can be downloaded free of charge from our website. Lines are open Monday - Friday, 8.00am to 5.30pm. Or you can e-mail us on ADChelpuk@abbott.com (please include your full name, address and telephone number).